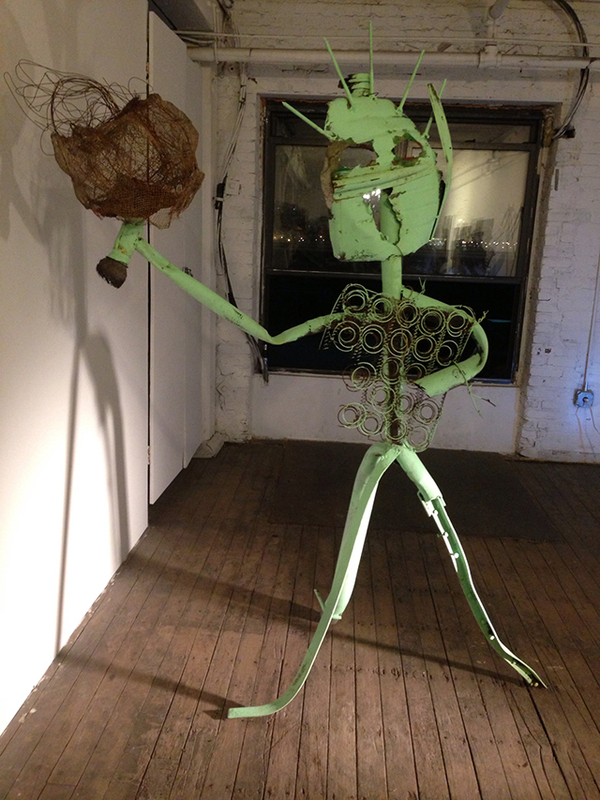 On the evening of May 10th, Greenpoint’s art spaces were abuzz. It was the first Friday night when everyone agreed to stay open late, a coming of age moment for the district. The night showed what up-and-coming artists find fresh and visually stimulating. A common theme stood out — neon. There was all this play with florescent hues and flashes of bold strident color. Making art pop with bright color has numerous precedents in art history. For example, Greek sculptures were covered with colored paint, a far more dazzling effect than our mental image of somber white figures. And Michelangelo’s Manchester Madonna in London, albeit unfinished, has this bright and incredible glow. The bright dots of the pointillists like Georges Seurat and Paul Signac are certainly memorable. And it’s almost unfair to name just one mid-century abstract artist that used bright colors. Artists of nearly every generation try to unlock “loud” color’s potential. But their challenge has been to individuate its usage, to make it their own, to stand out from the past and feel new again. Because so many have already gone bright, it’s harder to fudge. This is what makes it fascinating. These intense hues can become mirrors of their time’s interests — revealing what feels unique and singular at the moment. In the way Greenpoint artists are using neon, the zeitgeist of early 21st century art is glowing. Will you be surprised to hear about twisted sensibilities that find the charm in the self-conscious, messy, unpolished, paradoxical, eccentric, awkward and… wait for it… ironic? Whereas so much of bright color in modern art was about optimism and idealism, we’re now highlighting jaded and bewildering narratives as well as messier and quirkier patterns. To put it succinctly, a twist — on the formal or symbolic level — charges every work. And this makes colors that twist at the optic nerves so complementary. Neon and fluorescent shades will never entirely feel natural to the eyes and will always get a bit of a rise. Their garishness finds such synergy with the off-kilter narratives prevalent today. How could Arrested Development resist using neon orange to brand itself? For example, there were these wild textile works by Carey Sveen at the Yashar Gallery. The works in her show, Shoo: To Scare Away Ghostly intruders, which closed on May 29th, featured these bright silhouette shapes on fabric. They pack a strong visual punch. In “Jay, no hide-n-seek” (2013), there are rows of light bulbs, ties and tacks. Each neon shape has stitched border. There is something sort of wobbly and imperfect about these shapes but it suggests a charmingly human touch. Bright abstract works with a twist by James Biederman were on view at the Janet Kurnatowski Gallery‘s Don’t have Red in Sight, which closed on May 26. It featured several works that played games with color. For example. “Huck” (2013) took purple in such an incredible direction. It juxtaposed plummy reddish purple and a cool glowing blue violent hue. Keenly aware that perfection can get boring, the shape of the work is totally quirky. Some smudges in the bluish purple make the color field beautifully uneven. 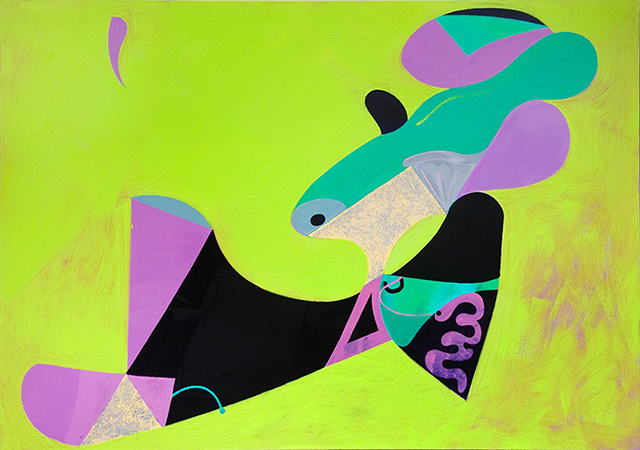 If Saturday morning cartoons were rendered with a neon-fauvist Dr. Seuss color palette, you might be getting close to Jamian Juliano-Villani‘s style. She’s part of a three person show at Beginnings, which closed on June 2nd. 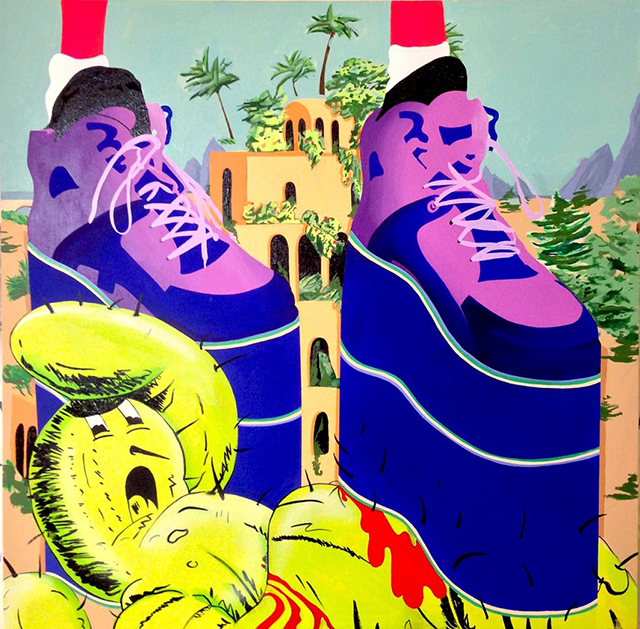 In “Hot Steeper” (2013), these bright fluorescent purple shoes crush a bright green cactus man. It’s a comic piece that doesn’t take itself too seriously. There are so many shapes for which there are no words in Lester Goldman‘s bright abstract paintings. 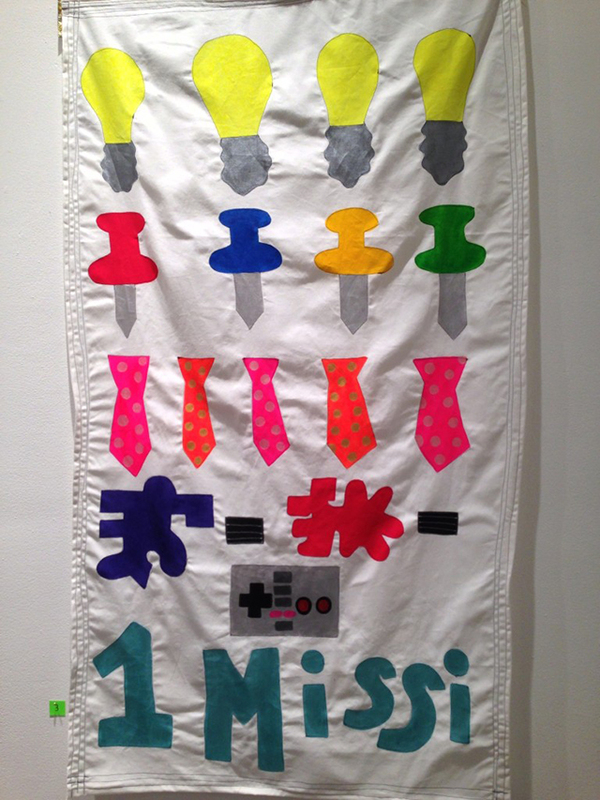 His neon canvases filled up the Dobbin Project Space‘s “High Wire” show, which closed on May 16th. For example, “Engine Er” (2003) pits bright green and purple against one other. The various silhouettes jive together and encourage your eye to trace along their jagged course. There were some bright illustrations of absurd situations by Drew Morrison at the Yard workspace. In “Big Business” (2012), a construction vehicle steam roles Jesus surrounded by a parade that includes a missile, a man in a radioactive suit, and an ironically small Santa Claus among a wider cast. The bright glaring colors heighten the sense of absurdity. The Statue of Liberty got a gruff and funky fluorescent green makeover at the Fowler Project Space. Ben Fain‘s reinterpretations of this New York icon are part of the “What possessed you group show,” which is on view through today. Ben Fain’s “Lady Liberty 3” (2013) is pointedly corroded and disfigured. Does anyone ever get the liberty she supposedly represents? The bright green color has this way of making all the imperfections stick out more, particularly against the neutral background of Fowler project space. None of this work took itself too seriously and there were lots of knowing winks at the viewer to lighten up. The high-minded perfection of minimalism and cool aloofness of pop art is not in vogue. And the ironic, imperfect, impolite, impolitic, and downright impish is now shining in the neon spotlight. Greenpoint Gallery Night took place on May 10th. All shows discussed have closed save for Ben Fain‘s at Fowler Project Space (67 West Street, Greenpoint, Brooklyn) which ends today. Drew Morrison at The Yard (33 Nassau Avenue, Greenpoint, Brooklyn) closed May 31. Lester Goldman at Dobbin Project Space (50-52 Dobbin Street, Greenpoint, Brooklyn) closed May 16. The show at Beginnings (110 Meserole Avenue, Greenpoint, Brooklyn) closed June 2nd. James Biederman’s show at Janet Kurnatowski Gallery (205 Norman Avenue, Greenpoint, Brooklyn) closed May 26. Carey Sveen at the Yashar Gallery (276 Greenpoint Avenue, Greenpoint, Brooklyn) closed May 29.